A picture dictionary and classroom poster ESL worksheet for kids to study and learn living room vocabulary. Look at the pictures and study the words. 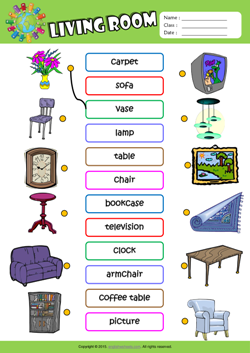 Useful for teaching and learning living room vocabulary. A fun ESL vocabulary matching exercise worksheet for kids to study and practise living room vocabulary. Look at the pictures and draw lines to match living room vocabulary. A printable ESL crossword puzzle worksheet for kids to study and practise living room vocabulary. 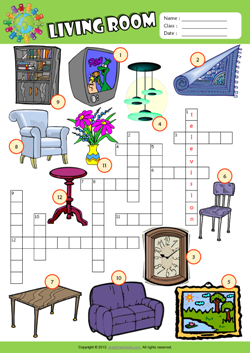 Look at the pictures and write the living room vocabulary in the crossword puzzle. 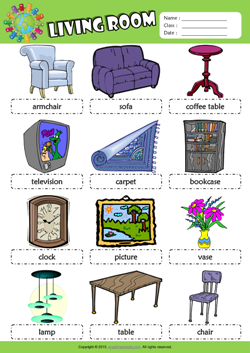 Useful for teaching and learning living room vocabulary. An enjoyable ESL word search puzzle worksheet for kids to study and learn living room vocabulary. 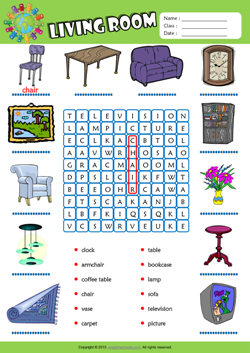 Look at the list and find the living room vocabulary in the word search puzzle. Then write them under the correct pictures.